This release is mostly minor bug and crash fixes as we prep for a public release. I have been having problems viewing notes that are encrypted. I am able to enter password but note is blank every time. Is there a way to resolve this issue? This new beta has the same problem, at least on my MBP. quinnius, thanks for the report. The link was a forum issue. any clue as to why the autoupdate fails? Known issue? Possible things to check? Beta eight still does not search any PDF's that came from my fresh20 subscription. I know Jackolicious requested I send him the pdf that is not searching but I don't know how as I know no way of sending an attachment through this forum. Thanks! Just did a quick "everything" search with the word "turkey." The beta came back with 27 results and the non-beta (for the same search) came back with 82. I found all pdf's related to fresh20 and only 29 of the 82 were those pdfs. That means there are 53-27=26 additional pdf's that are not being searched by the beta. I wonder how many other people are having similar results. Feel free to send me a public note link too. Fantastic, the terminal command has made the auto update work for me again! Y'all know what I want to complain about. Major deal breaker merging notes bug is still alive and well. My patience has worn out, back to 5.5. Another thanks for the terminal command...works great! If you look at the note info for that note, what do you see in the Attachment Status? Does it say the PDF has been indexed? The in-app update (B7->B8) failed at first, but the terminal command fixed it. Indeed it looks like pdf searching is not working as it should. Did some test by using the same search on my mac, ipad and android. My mac shows 0 notes, my ipad 29 notes and my android the same 29 notes. I've unsuccessfully tried to update to Evernote for Mac 5.6 Beta 8 but each time, I'm only getting about 10% of all my notes to sync. So I've had to uninstall and go back to the public version and they all come back. I've done this about 10 times, both at home and at work, to no avail. Maybe the Beta 9 will fix this?? Mark923, please PM me your activity log file. I gave the beta version a try. On 10.7.5 (older Macbook that will support nothing newer), the beta would consistently crash when moving notes from my default notebook into another notebook. I eventually reverted to 5.5 for this reason. I really don't know if it's because of the last beta, but Attached files in notes started to randomly disappeared. I put two notes in a shared folder i joined yesterday, and now only the text is there. No more files on the iOS or mac app. also, Can't access version history since the note is in a notebook i joined. I downloaded the new version, but I'm having one heck of a time finding the release notes. I swear I've downloaded the program 10 times today while clicking through the site, looking for the release notes (clicking over to the download area simply starts the download). By any chance, do you know a place where I can read them? I want to bang my head against the wall. Alright, check it, maybe you guys call it something other than release notes, but let me sort of explain my dilemma. Before leaving work today, I upgraded to 5.6 Beta 8. On the pop-up screen asking me to update, there was a changelog or list or whatever you call it listing everything that has changed since the last version. This is kind of key information, otherwise we simply don't know what to look for. Well, I didn't have time to read it, so I figured I'd read what's new when I got home. Well, now I'm home, and after searching for 20 minutes, and downloading the program yet again from the first post in this thread (your bandwidth bill's going to be on the high side this month), I'm going to have to give up. I can't find the "what's new" list anywhere. Anywhere. ANYWHERE!!!! Good grief on a bed of nails, fellas, I'm sure it's somewhere, but calling it un-untuitive would be the understatement of the century. Please consider making this stuff easier to find. From what I remember seeing, the release notes for Beta 8 said "Bug fixes". For me, the terminal command did fix the download issue, but now I'm stuck at a window "Migrating notes from previous version". It hasn't moved at all in several minutes. As soon as I posted that, I checked and there were my notes. -The auto updater "check" in the past betas does not work with my setup OSX10.9.4, even though I have it "checked" in the preferences. Yeah, my bad (post deleted), I just had one pop up. Turns out it's really "recently updated notes" and with the beta upgrade it just reset everything. After I updated a note, it appeared. Can happen ;-) Good luck !! BUG REPORT: EN Mac 5.5.2 displays popup window requesting to update to EN Mac 5.6 Beta 8 even though I have UNCHECKED "Update to Beta versions when available". I created a 4x4 table within a note and entered formatted text into the table. I then tried to simplify formatting after pasting additional text in the note (under, not in the table). When I simplified the formatting it removed the table I had created, leaving the text from the table listed along the left margin of the note. Is there a way to simplify the formatting of a note without destroying tables? jvojordo, great request. Looking into it. Here's a but that I've been seeing since upgrading to the new beta. Annotated PDFs will not show as attachments. After restarting, the revert to being shown as inline. I've seen it happen with some "un-annotated" PDFs as well, but pretty much every note with annotated PDFs attached experiences this bug. A few days ago I upgraded to 5.6 Beta 8. Today I was looking for my local stored notes on my mac and it appears that they are no longer saved in my library (application support). Does someone knows what happened to them and where they are stored now (spotlight can't find them)? Meanwhile I was able to find my notes: Still they are stored under Application Support, but now in the file named com.evernote.Evernote. 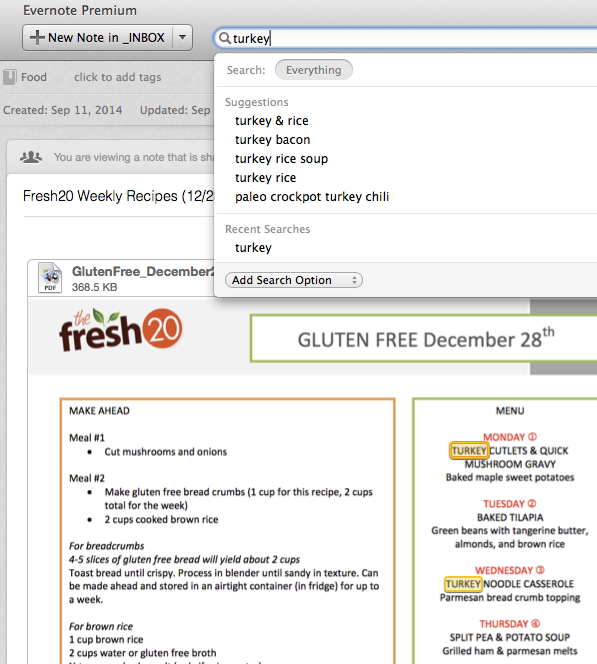 I downloaded the PDF from the note that you shared, clipped it into my evernote and I was able to successfully search for "turkey". Jack, I realize that this is not the best place to make an Enhancement Request, but would you consider adding an icon/button to create a Saved Search as part of this Beta process? I would also move the menu item from Edit to File > Save Search. As you can see from the EN KB Article below, both EN Win and EN iOS have such an icon, which makes it very obvious and easy to create a Saved Search. I just had an occasion to create a Saved Search in EN Mac 5.5.2, and I could NOT firgure out how to do it, even after two careful reviews of the UI and the menus. It never occurred to me to look under Edit > Find > Save Search -- that is so counter-intuitive. Creating Saved Searches have NOTHING to do with editing or finding. EN has used the term "find", as opposed to "search", to mean finding text within the Note body. Windows: Perform your search, then click the Save Search icon (magnifying glass with + symbol on it). Mac: Perform your search, then select Edit > Find > Save Search. iPhone, iPad and iPod Touch: Perform your search, then tap the Save Search icon (magnifying glass with + symbol on it). Android: Perform your search, then tap Add to Home Screen. my sync icon stays red as well. I looked at my activity logs and can't say it's exceedingly obvious what's going on. I suspect it has to do with 2 phantom notes in my database the last production release (402634) introduced due to a bug that caused it to crash and no longer startup. chinarut, are you submitting crash reports each time? Please include your name and email when you do. It helps us track users to their crashes for debugging purposes. @Jackolicious: yes - i did submit crash reports so it sounds like that's the correct route. I had to revert to the 5.5.2 release the behavior was so odd and figure out what's going on. what happened if I kept moving notes into notebooks and they kept unpredictably going somewhere else. after logging into a 5.5.2 client - turns out a Business notebook that claimed to exist actually doesn't exist. I checked the Admin console and yup - one of the business notebooks is missing. I'm going to do what I originally intended to do with the 5.5.2 client and see if it works as intended. a less serious issue was funky behavior with Business tags. I deleted unused tags in my Admin console and they were still there in the desktop client. I had to go to the notes themselves and delete 1 tag before it would finally go away. Note counts are not updating when dragging notes between folders. This is getting confusing now as to what is fixed and still outstanding as bugs and in turn at the sound of repeating ourselves, what is the reporting method for bugs...? For me the issue with Tables, Presentation Mode and Shared Links where the Tables are all over the place is highly annoying when trying to share / collaborate. I believe a bug that was fixed in a previous version is now back in Beta 8? It is in relation to the annotation of a note in Expanded Card View where you annotate and return to the note and you loose cursor movement. You have to exit the note and go back in... Not ideal. This is why we need detailed Release Notes with each Beta release (as so many have requested) so that we, the users, know what has been fixed, what is new, and what we need to test. Evernote, we are providing you with a free, highly valuable (to you) service. Please help us help you by providing us with detailed release notes. Surely you have this information internally, why not share it with us? Phil, please elaborate. I'll post more detailed notes in our next release. It never occurred to me to look under Edit > Find > Save Search -- that is so counter-intuitive. ditto on this front. do we have a means to access (or at least have partial access) to Evernote's issue tracker? it would indeed be nice if we could search this database first for any issues we encounter. It's also nice to see a list of "known issues" before upgrading to a particular beta. I don't see anything "harsh" about my post -- simply stating my assessment on UI ease of use. I don't recall any other apps that put "saving" something under the "Edit" menu. "Saving" functions are usually found under the "Find" menu. OK, I see 5.6.0 has been released, that's interesting considering there are still several serious issues that need addressing...? Tables in presentation mode is still awful. Is this a closed thread now? Is this the latest beta still? Evernote got corrupted so I need to reinstall it. I think the corruption may have had to do with saving via Postbox. Won't know until I test it again .. . which will not be tonight. Jack, could you please help us out with what we need to report and what not? I agree with Phil that some kind of bug tracking system that beta testers can post to would be most helpful. We want to help! That is why we do this. But I feel I am repeatedly reporting the same issues!! And frankly, my time is worth more than that!! When creating a new note using Command/Option/Control/N - the main Evernote window opens up behind the new note . . . every single time - occluding the screen already open on my desktop, forcing me to close or minimize the Evernote main window yet again, and completely interrupting my thought flow. QuickNote does NOT replace the new note function because it is too limited; no way to put in lists, or any of the other features in a normal new note. #1 is bad enough for me that I have started using text edit. At least there I can make outlines and lists on the fly. Cannot drag and drop into an Evernote. It does not work from iPhoto (and it used to). Often does not even work from File Manager. Could you at least make them darker gray? Viv, I totally agree with you. This is a great topic. But this thread, for Beta 8, is not the best place for this since Beta 8 is long over, and this is not really an active thread. I'd suggest you start a new thread, and probably best in the Evernote General Discussion, since it really applies to all platforms, not just the Mac platform. Feel free to include quotes from this thread if you like. Good luck. I really hope your post/thread gets a lot of attention. No. I do not feel it is a public topic. I am not at all suggesting a public bug tracking system!! In fact I think that would be a terrible idea and not at all good for Evernote in regards of marketing or image. I am specifically requesting one for those of us who are Private Beta Testers and who continue to test the most recent beta - even when it is a public beta. Because there is no bug tracking system that we as private beta testers can see, we have to keep reporting the same issues. Phil & ChinaRut are addressing the same issue above. I see that 5.7 was just released a couple of hours ago. So I will see if the issues still remain and then post over there if they do. I wasn't necessarily suggesting a public bug tracking system. However, this thread that you have posted in is in the PUBLIC part of Evernote forums. Evernote has strongly resisted providing the type of data you are requesting, and I very much doubt that they will change without strong support from users and beta testers. @Viv - I'm aligned with custom access to a change tracking system for beta testers (not public). What I can do is take the new thread you create and cross-post it to our EBCCs and get additional support. Do post the link to new thread here so you may redirect all of us here who are interested! Guys I know this has nothing to do with this thread and I do not wish to air this in public (with @Viv on this), but with 5.7.2 I am crashing daily almost and the bugs discussed in this thread are still there in the GA software. On that basis why is there not a new beta group or thread?? There is no need to hide crash reports. In fact, it is a benefit to all for you to post these publicly and in the 5.7.2 thread. There are many other bug reports and crash reports for 5.7.2 being posted. BTW, this thread (the one you posted in) is NOT a private thread. It is viewable to all.